You can now buy a brand-new Sonos One or Play:1 stand for £25 | What Hi-Fi? Amazon is currently offering generous discounts on several Flexson-branded Sonos accessory stands for the Play:1, Play:3 and Playbar, but for owners of the new Sonos One smart speaker that don’t want it to be plonked on a windowsill or coffee table, there is another budget alternative: the all-new Flexson S1-DS desk stand. Also compatible with the Play:1, the new S1-DS is designed to angle the speaker to your ear for optimal dispersion. 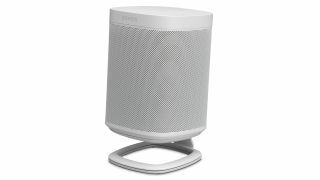 It’s made of metal, is available in black or white to suit your Sonos speaker finish, and has the same footprint of both speakers. It's available now, priced £24.99.